Calling out all the skilled culinary artists of the backyard grill. 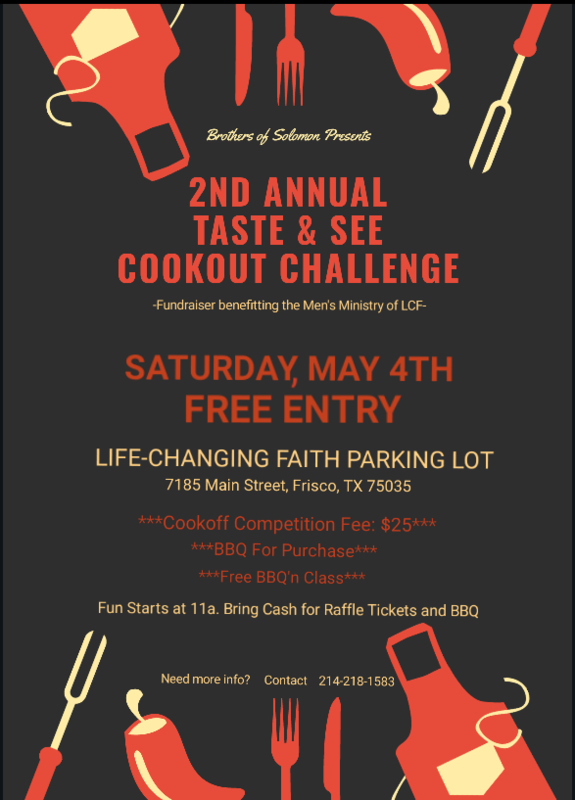 On Saturday, May 4th 2019 our Brothers of Solomon Men’s Ministry will be hosting the 2nd Annual Taste and See Cookout Challenge fundraiser in the Life-Changing Faith Christian Fellowship Church parking lot. This fun filled event consists of a barbecue grilling competition, barbecue instructional class, Barbecue plates for purchase and a raffle for prizes. The entry fee for the grilling competition is $25. We hope to see you all there for some exquisite food, fun and fellowship!